Around 86% of the respondent in Estonia recognized the smoke detector's fire alarm followed by Finland where 78% of the respondents were able to correctly identify the smoke detector’s fire alarm. In Denmark, 56% of the respondents recognized the smoke detector’s fire alarm, while in Lithuania less than half (49%) of the respondents recognized it. 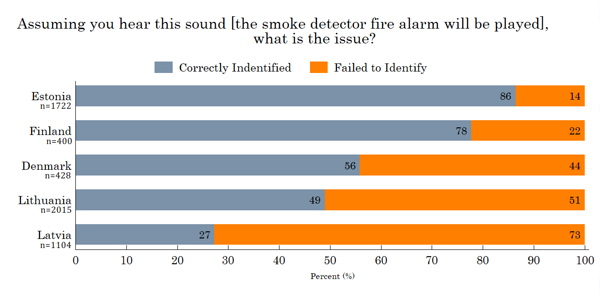 Just 27% of the respondents were able to recognize the smoke detector's fire alarm (see Figure 11). The smoke detectors sound of an empty battery, in turn, was recognized by 69% of study participants in Estonia. Less than half (48%) of the Lithuanian respondents recognized the sound of an empty battery of the smoke detector, followed by Finland with 44% of the respondents recognizing it. 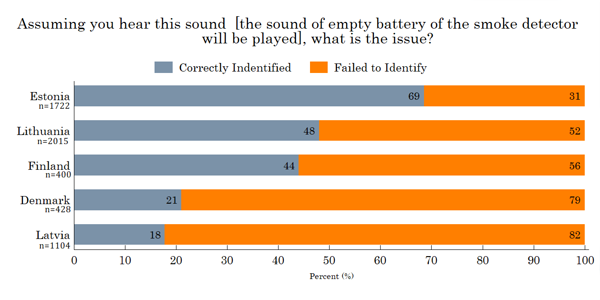 21% of the Denmark respondents were able to identify the sound accurately while just 18% of Latvian study participant recognized the smoke detectors sound of an empty battery (see Figure 12). Asked whether during the last year they have discussed the fire safety and how to act in case of the fire, Estonia leads with 61% of the respondents marked that there has been discussion about fire safety at their home followed by Finland where almost half (49%) of respondents indicated that the fire safety issues have been discussed. In Lithuania, 41% noted that proper behavior in case of the fire has been discussed at home while in Denmark only 37% of respondents responded that discussion related to fire safety took place in their household. 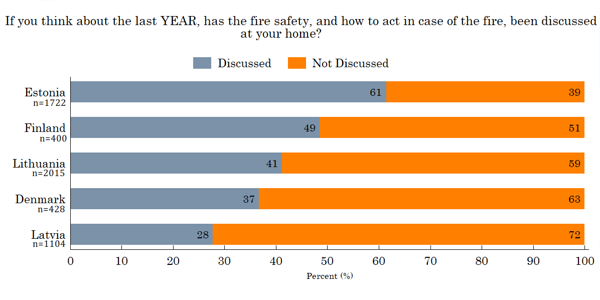 In Latvia, the fire safety related discussion took place in just (28%) of the households (see Figure 13). 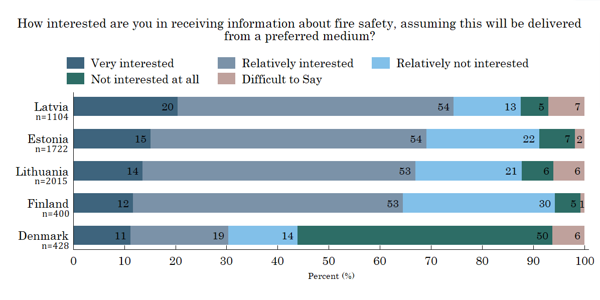 When asked how interested they are in receiving information on fire safety, 74% of the Latvian respondents said that they are interested (“very interested” and “relatively interested”) followed by Estonia where 69% of the respondents said that they are interested. Estonia is closely followed by Lithuania and Finland with 67% and 65% of respondents saying that they are interested in fire safety information respectively. Only 30% of the Danish respondents indicated that they interested in receiving fire safety information. The lack of interest (“not interested at all” and “relatively not interested”) was admitted by 18% of the Latvian participants of the study. 29% of the Estonian also marked that they are not interested in receiving such information and 27% of Lithuanian respondent also indicated the same lack of interest. In Finland, 35% of the respondents said that they are not interested in receiving information related to fire safety, while in Denmark 64% of the respondents reported that they are not interested in receiving fire safety information. For a significant number of people, it was difficult to say whether they want to receive such fire safety information or not. For 7% of Latvian, it was difficult to say while 6% of respondents from Lithuania and Denmark each also failed to answer this question. In Estonia, 2% of the respondents find it difficult to answer while in Finland only 1% of the respondents find it difficult to say whether they need fire safety information or not (see Figure 14). When asked whether they have children aged 5-15 in their household, in total 29% of the respondents out of 5669 answered in affirmative. Respondents who replied that there are children aged between 5 and 15 in their household (n=1630) were asked to indicate whether they have received information on fire safety from their children who attend a kindergarten or a primary school. In Estonia, 68% of respondents replied that they have received it followed by Latvia where 47% of the respondents said that they received such information. 41% of the Finnish study participants who replied that there are children aged between 5 and 15 in their household answered that the information on fire safety from their children has not been received, 38% of Lithuanian also received such information while just 21% of Danish respondents said they received the fire safety information. About 24% of study participants from Estonia who replied that there are children aged between 5 and 15 in their household answered that the information on fire safety from their children has not been received. The proportion of respondents who have not received such information is Latvia- 42%, Lithuania-53%, Finland-58% and Denmark-78%. 4% of Latvian respondents said that their children do not go to kindergarten or primary school, 2% of Lithuanian respondent said the same. In Estonia and Finland 1% of the respondents from each country said that their children do not go to kindergarten or primary school, while for 7% of the respondents from each of the of country Estonia, Latvia and Lithuania, it is difficult to say (see Figure 15). According to the survey, 83% of Finnish respondents replied that it is important (answers “very important” and “relatively important”) to have a fire extinguisher in their home. 81% of Estonian respondents also said that they consider fire extinguisher important, while 69% of the Lithuanian believes the same. In Denmark, 68% of the respondents indicated that they consider fire extinguisher important while 64% of the Latvian respondents replying that the fire extinguisher is important. The opposite opinion (answers “relatively unimportant” and “not important at all”) have 17% of study participants in Finland. The proportion of respondents replying that the fire extinguisher is not important in other countries is Estonia – 19%, Lithuania- 22%, Latvia-28%, and Denamark-30%. 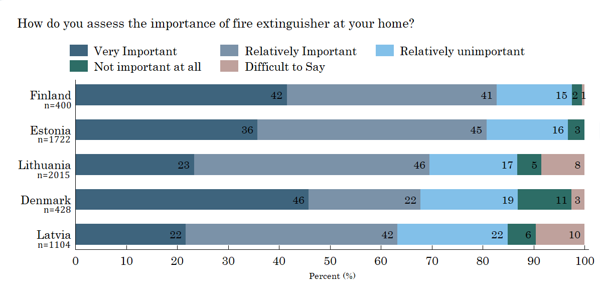 For 10% of Latvian resident, it is difficult to assess the importance of fire extinguisher in their home while 8% and 3% of the Lithuanian and Danish respondent also find it difficult to answer this question respectively (see Figure 16). Asked whether or not they have a fire extinguisher in their home, 47% of Finnish respondents replied that they have one followed by Denmark where 42% of the respondent replied in affirmative. 34% of Estonian respondents said that they have a fire extinguisher at home while just 17% and 13% of Lithuanian and Latvian respondents indicated that they have a fire extinguisher at home respectively (see Figure 17). In total, 93% of Finnish respondents indicated that they have competence in using a fire extinguisher (answers “definitely know how to use” and “probably know how to use”). In Denmark, the proportion of respondents who indicated that they know how to use a fire extinguisher is 86% while 83% Estonian indicated the same as well. Only 58% Latvian and Lithuanian respondent said they have competence in using a fire extinguisher. Only 7% Finnish respondent noted that they do not know how to use it (answers “definitely do not know how to use” and “probably do not know how to use”) while 13% Danish, 17% Estonian, 39% Latvian and 40% Lithuanian respondents said that they do not know how to use fire extinguisher (see Figure 18). When asked to indicate whether they have used a fire extinguisher in training or in the real situation, 77% of Finnish respondents replied that they have used it, 71% of Estonian respondents also indicated that they have used it. In Denmark, about 63% of the respondents replied that they have used it while just 47% of Latvian respondents have used a fire extinguisher. Two-third (66%)of the respondent in Lithuania have indicated that they have never used a fire extinguisher, in training or a real situation (see Figure 19). According to the survey, 99.5% of Finnish respondents replied that it is important (answers “very important” and “relatively important”) to have a smoke detector at home. Finland is closely followed by Estonia where 95.5% of participant consider smoke detector as important and 94% of Danish respondent also finds it important. 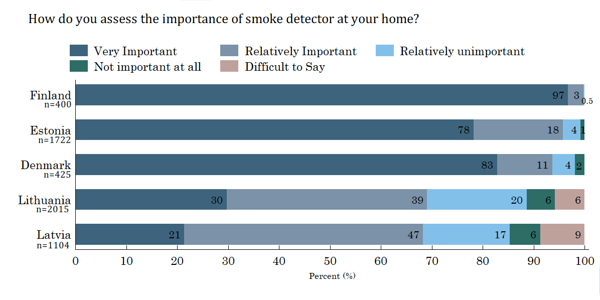 Only 69% and 68% of Lithuanian and Latvian respondents consider smoke detector as important respectively. The opposite opinion (answers “relatively unimportant” and “not important at all”) had just 0.5% of Finnish study participants, while in Estonia and Finland only 5% and 6% of the respondent do not find smoke detector as important respectively. In Lithuania and Latvia, 26% and 23 % of the respondent do not find smoke detector as important respectively while for 9% of Latvian and 6% of Lithuanian respondent it is difficult to assess the importance of fire extinguisher (see Figure 20). In answering the question “When you think about the last month (30 days), have you or someone from your household controlled the working condition of the smoke detector (pushing the test button)?”, 62% of respondents who have a smoke detector marked that they have controlled it. In Finland, Lithuania, and Latvia the same proportion, 47% of the respondents have controlled the smoke detector in last 30 days, while just 43% of the Danish respondents have controlled it (See Figure 22). Asked about doing smoke detector’s maintenance in the last month to the respondent, more than half (53%) of Danish respondents marked at least one action to maintain the smoke detector. It includes 10% of the respondents saying that the smoke detector has been cleaned with a piece of cloth, 30% said they changed the batteries while 13% performed both the actions. In Estonia, 44% respondents marked at least one action to maintain the smoke detector which includes 22%-cleaning and 22%- changing battery, while 56% has done no maintenance at all. 67% of Latvian have done no maintenance, 12%- done the cleaning, 17% changed the batteries and just 4% done both the work. In Finland, only 5% cleaned the smoke detector and 17% changed the batteries and 7% performed both actions, while 71% did no maintenance. 79% of Lithuanian did not do any maintenance work while just 12% cleaned the smoke detector and 10% changed batteries (See Figure 23). Regarding the type of heating in their home, 70% of Latvian respondents noted that there is only central heating in their housing and 30% - that there is only a stove heating or a fireplace. 58% of Lithuanian respondents indicated that there is only central heating in their housing and 42% - that there is only a stove heating or a fireplace. Almost half (48%) of study participant in Estonia said that they have central heating in their home while 52% said that they have stove heating or a fireplace. 44% of Danish respondents said that there is only central heating in their housing and 56% - that there is only a stove heating or a fireplace. Finland has the lowest proportion of home with only central heating 40%, 60% of Finnish respondents responded that they have stove heating or a fireplace (see Figure 24). Estonian respondents who have a stove or a fireplace, 90.5% of respondents marked that someone has swept chimneys of their heating system in the last two years: 29% of respondents responded that they or someone from their family/acquaintances has swept the chimneys, while 62% have paid to a professional for this service. 8% of the study participants indicated that no one has cleaned chimneys in the last two years. In Finland, 87% of respondents marked that someone has swept chimneys of their heating system in the last two years: just 3% of respondents responded that they or someone from their family/acquaintances has swept the chimneys, while 84% have paid to a professional for this service. 9% of the study participants indicated that no one has cleaned chimneys in the last two years. For 3% of the respondents, it is difficult to answer this question. 78% of Latvian respondents marked that someone has swept chimneys: 45% of respondents responded that they or someone from their family/acquaintances has swept the chimneys, while only one-third (33%) have paid to a professional for this service. 14% of the study participants indicated that no one has cleaned chimneys in the last two years. For 8% of the respondents, it is difficult to answer this question. Lithuanian respondents who have a stove or a fireplace 69% of respondents marked that someone has swept chimneys of their heating system in the last two years: more than half (51%) of respondents responded that they or someone from their family/acquaintances has swept the chimneys, while just 18% have paid to a professional for this service. 31% of the study participants indicated that no one has cleaned chimneys in the last two years. 60% of Danish respondents marked that someone has swept chimneys: just 1% of respondents responded that they or someone from their family/acquaintances has swept the chimneys, while 59% have paid to a professional for this service. 37% of the study participants indicated that no one has cleaned chimneys in the last two years. For 3% of the respondents it is difficult to answer this question (see Figure 25). Estonian Respondents, whose house is equipped with stove heating or a fireplace were asked whether someone has swept chimneys of their heating system in the last five years. About 90% of respondents whose house has stove heating or a fireplace responded that they have paid to a professional for this service. In Denmark, 76% of the respondents have indicated that they have hired a professional to swept their chimney during last five years, followed by Finland where 59% of the respondent have hired a professional to swept their chimney in last five years. In Lithuania and Latvia, only 14% and 13% of the respondents have hired a professional to swept their chimney during last five years respectively (see Figure 26). Asked whether they or someone from their household sometimes smokes indoors, only 1% of Finnish respondent answered that smoking is done indoors. In Denmark, 7% mentioned that smoking is done indoors. In Estonia, 16% of respondents answered that smoking takes place inside the household. In Latvia and Lithuania, 20% and 26% of the respondents answered that smoking is done indoors respectively (see Figure 27). According to the survey, in the case of fire, 99% of Finnish respondents would call 112 which is the correct emergency number to dial in case of a fire emergency. 95% of Estonian will dial the correct number while 90% of Lithuanian will dial the 112 as well. 87% Danish and just 75% Latvian will dial the correct number “112” in case of a fire emergency (See Figure 28). When asked “Thinking back to two last years, have you come across any activity provided by a fire authority?”. According to the survey, 75% of Estonian respondents have come across to activities provided by a fire authority, 55% of Latvian respondents have come across to activities provided by the fire authority while almost half (49%) of the Finnish respondents also came across such campaigns. Only 27% and 22% of Lithuanian and Danish respondents have come across the activities provided by the fire authority respectively (see Figure 29). When asked “How long can a sleeping person survive in case a fire starts in the very same room?”, 60% of Finnish respondents chose the correct answer that a sleeping person would survive for 5 minutes. 52% of Danish respondents also chose the correct answer and exactly half (50%) of Estonian study participants picked the right answer of 5 minutes while just 36% and 30% of Lithuanian and Latvian chose the right answer respectively. 38% of Finnish, 37% of Estonian and Lithuanian each, 31% of Danish and 26% of Latvian respondent chose the incorrect answer while 44% of Latvian, 26% of Lithuanian, 15 % of Danish, 13% of Estonian and just 3% of Finnish respondents find it difficult to answer the time a sleeping person would survive in case a fire starts in the very same room (See Figure 30).